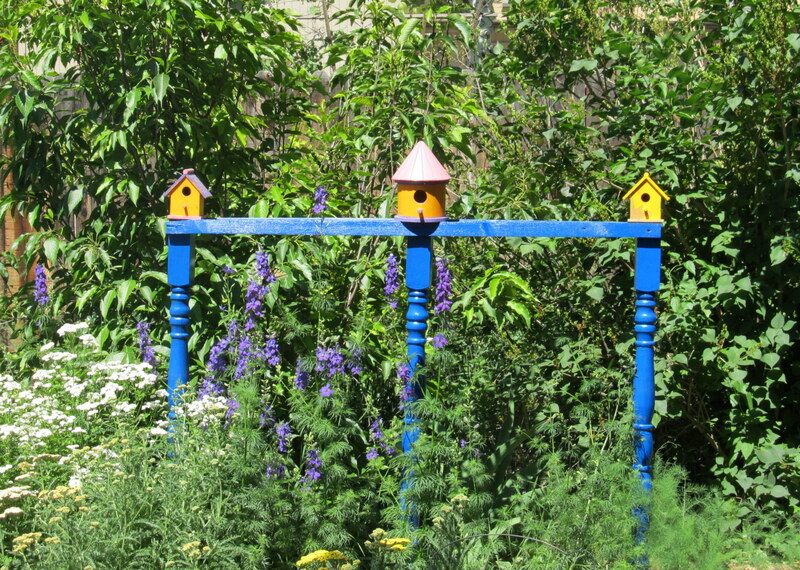 Last year, I wrote about my half-assed attempt to mount birdhouses in my garden, on posts from the thrift store, with rebar and duct tape. Today, I have a more fully-assed attempt, where I actually used wood and a drill, and screws to build a kind of trellis structure. No duct tape at all. I have drilled 1/2 inch holes in the bottoms of the posts, and driven 1 foot rebar stakes into the ground, at the right distance apart from the holes. Trust me, I measured! I stepped on some plants in the meantime, but I did measure. I laid out the pieces on the ground before screwing them together- here you can see where the hole is drilled for the rebar. 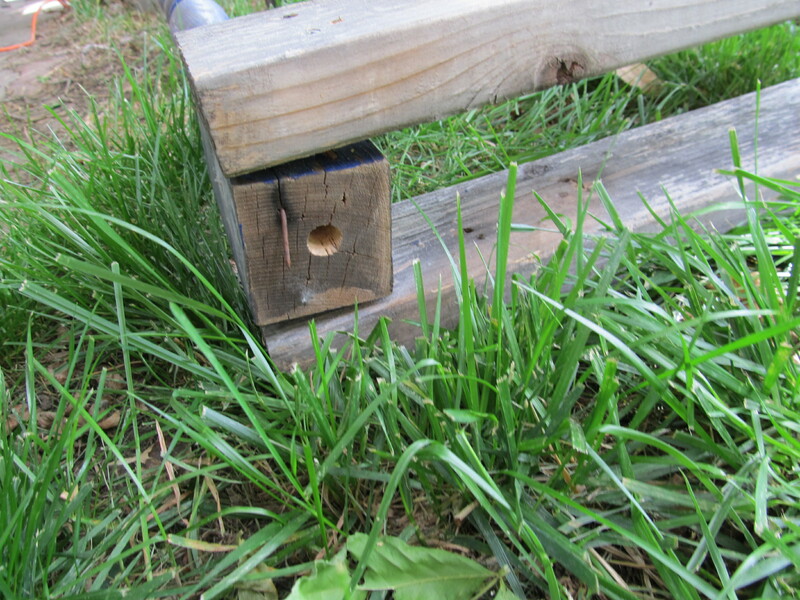 Having a 2×4 on both sides of the base makes the whole structure sturdier. I had some wood left from taking apart the playhouse (no worries- there will be a new and better shed playhouse in the future) so I used it to brace the posts. Screwing it onto both sides makes the structure stable by triangulating it. I let the length of the wood determine the size of the structure- the posts are roughly 42 inches tall, the leftover wood was roughly 50 inches long, I used three of the posts for the structure. The fourth might become a bottle tree. Too tacky? I painted the top cross bar and the posts bright blue, but not the base- the weathered gray wood will become kind of invisible against the ground. I used “Surebonder Clear 9001” glue to attach the birdhouses, which we painted 5 years ago? A really long time ago, and they have been sitting around. I realize the glue won’t be permanent, but I am not too worried about it. Larkspur, yarrow and chamomile blooming, silver buffalo berry bush and lilac in background. I decided this space needed a structure because it is so green- shrubs, self seeded annuals, weeds, perennials. I like having a frame to make it more formal, but not in a “pinkie-up while you drink your tea” kind of way. Formal like having a frame around a picture- any structure works for this, a flowerpot, a trellis, a headboard. There has been a forest fire to the northwest of here- we are not at any risk, other than from the smoke. The smoke has made it really unpleasant to get out and garden. It is better today, so I hope to get some stuff done.